The enduring late medieval textbook 'Compendium of Theological Truth' ('Compendium Theologicae Veritatis') has been attributed to an unusually large number of authors, including Thomas Aquinas, but recent studies conclude that Hugh of Strasburg wrote it in the 2nd half of the 13th century. It presented in a practical arrangement discussions of a wide range of topics. This copy belonged to the Franciscan convent at Worcester. The manuscript also includes the tract 'Flecto genua mea' (from Ephesians 3:14) which was associated with the Franciscan order. 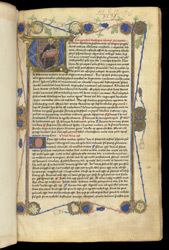 A title in red letters on the first page says that Thomas Aquinas was the author. The Dominican monk depicted studying within the first letter certainly was meant to portray Aquinas. Author portraits as introductory pictures for books were conventional in the middle ages and went back to origins in Roman books. The natural-looking flowers and vines of the border remain unfinished: only the left side of the border has completed shading and highlights. The sense of mass and space in the portrait reflect the influence of Italian renaissance styles.